Earlier this year, we were delighted to find out that we’ve been awarded the "Double Diamond" status as an NEC phone system dealer in their Smart Partner Program. Our team has worked hard for this honor, learning all the ins and outs of the products, and meeting the strict requirements set by NEC. 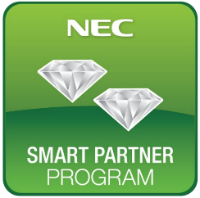 Thanks to this Smart Partner Program, we’re able to work even closer with NEC to provide our customers with the latest communications solutions. We’re always happy to recommend NEC’s unified communications solutions to our customers because of the many features and the flexibility they provide for the modern workplace. By combining your voice, messaging, and email applications in one, central application, you can finally get an overview of your communication tools. Even better, everything is accessible from your mobile device, letting you work from anywhere, anytime! We are committed to spreading the benefits of these NEC solutions to our valued customers and look forward to the additional resources that our partnership will provide. You can read about our other awards and the latest news about our products and services anytime, right here on our website!